Musical From Royal Books, Inc.
< Back to Royal Books, Inc.
Browse all Musical from Royal Books, Inc.
All new arrivals from Royal Books, Inc.
Los Angeles: Twentieth Century-Fox, 1975. Vintage photograph of Tim Curry as Dr. Frank N. Furter in the classic 1975 film. With holograph notations on the verso. 10 x 8 inches (25.5 x 20.5 cm). Near Fine. National Film Registry. Weldon 1983. Paris: Parc Film, 1964. 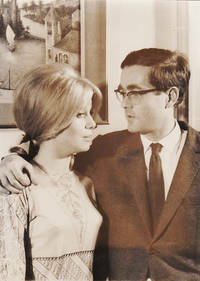 Vintage borderless press photograph of actor Catherine Deneuve and composer Michel Legrand at the awards ceremony for the Louis Delluc Prize, given to the best French film of the year, which "The Umbrellas of Cherbourg" received in 1964. With the stamps of ADP press agency and a French-language mimeo snipe on the verso. In addition to that award, the film won the Palme d'Or and two other prizes at the 1964 Cannes Film Festival, and was nominated for five Academy Awards, including Best Foreign Language Film, Best Original Screenplay, and the first three nominations of Legrand's storied career as a composer. . Shot on location in Cherbourg, France. 5 x 7 inches (13 x 18 cm). Very Good plus. Criterion Collection 716. Godard, Histoires du cinema. Los Angeles: RKO Radio Pictures, 1936. Treatment script for the 1937 film. Almost certainly the earliest draft associated with the film, a typescript prose synopsis. A ballet start falls in love with a young dancer on a trans-Atlantic voyage, but rumors of their relationship precede them to their destination. The seventh of ten films Fred Astaire and Ginger Rodgers would make together, and the fourth of five directed by Mark Sandrich. Green titled wrappers, noted as Treatment on the front wrapper, rubber-stamped PLEASE RETURN TO RKO STORY FILES and production No. 808, dated October 16, 1936, and with a credit for screenwriter Mark Sandrich. Title page integral with the first page of text. 26 leaves, with last page of text numbered 26. Typescript. Pages Near Fine, wrapper Very Good plus with a few tiny chips at the extremities, bound with two gold brads with washers. Hirschhorn, The Hollywood Musical. Culver City, CA: Columbia Pictures, 1944. Vintage borderless publicity photograph of Rita Hayworth from the 1944 film. INSCRIBED by Rita Hayworth ("To Todo"). With holograph notations on the verso. Rusty (Rita Hayworth), a young chorus girl at a nightclub ran by her boyfriend Danny McGuire (Gene Kelly) gets a chance at stardom after John Coudair (Otto Kruger), a wealthy magazine editor puts her on the cover of his magazine, potentially jeopardizing her relationship with Danny. Winner of the 1944 Academy Award for Best Musical and nominated for four others. 9.25 x 7.25 inches (23.5 x 18.5 cm). Near Fine. Eureka Masters of Cinema 162. Twilight Time. Los Angeles: Twentieth Century-Fox, 1943. Final Script for the 1943 film musical, "Sweet Rosie O'Grady," directed by Irving Cummings, written for the screen by Ken Englund, William R. Lipman, Frederick Stephani, and Edward van Every, and starring Betty Grable, Robert Young, Adolphe Menjou, and Virginia Grey. A loose remake of the 1937 film, "Love is News" with Tyrone Power and Loretta Young, "Sweet Rosie O'Grady" finds Betty Grable in London, seeking to better herself as an artist, which in 1943 means landing a wealthy duke for a husband. But newspaperman Robert Young has other plans for her love life. Remade once more as a comedy in 1948, as "That Wonderful Urge," with Tyrone Power and Gene Tierney. Blue titled wrappers, stamped FINAL on the front wrapper, rubber-stamped project No. 814, copy No. 5, and dated November 25, 1942. Distribution page present, with receipt removed. Title page present, with date matching the front wrapper, and a credit for screenwriter Englund. 126 leaves, mimeograph, rectos only. Pages Near Fine, wrapper about Near Fine, bound with two gold brads. Hirschhorn, p. 231. Cambridge: Harvard University Press, 1952. First Edition. First Edition. A collection of six lectures delivered by Copland at Harvard University in 1951 and 1952. About Fine in a Very Good plus dust jacket. Spine ends lightly bumped, else book is Fine. Jacket has a few small chips and closed tears at the extremities. A tight, attractive copy. Hollywood: Paramount Pictures, 1938. Set of three vintage black-and-white studio still photographs from the set of the 1938 film noir antecedent. Shown respectively are Lang conferring with Silvia Sidney, Lang on the floor setting up an unusual camera angle, and Lang playing a clarinet for baby actor Donald Dodd's (who played Silvia Sidney's infant son in the film). Each photo with a printed snipe on the verso, a number annotated and circled in blue pencil (1, 2, 3 respectively), and a stamp crediting Paramount Studios photographer Malcolm Bulloch. 5 x 7 inches. Near Fine. One photo with a faint vertical crease. Complete collation details available on request. Spicer, p. 403. Burbank, CA: National Broadcasting Company [NBC], 1961. Draft script for the 1961 television special. A musical special in the form of a cultural forecast, in anticipation of a changing world. The show addresses topics including: science, technology, politics, entertainment, and leisure. Grey titled wrappers. 83 leaves, with last page of text numbered 82. Mimeograph, with pink, yellow, and blue pages throughout. Pages Fine, wrapper Near Fine, bound with two gold brads. Los Angeles: Columbia Broadcasting System [CBS], 1966. Final Draft script for the 1966 television special. Ed McMahon's presentation copy, with his name in gilt on the front board. McMahon served as the show's announcer. The second of five annual television specials by Frank Sinatra, after his departure from Columbia and the founding of Reprise Records saw him more in control of his career and revitalized artistically. In the same way he did with his now-legendary Reprise recordings, Sinatra up-ended the whole idea of a 1960s television special by focusing the special's content entirely on performance. Nominated for nine Emmy Awards, including Outstanding Variety or Musical Program, winning one. Title page present, dated 6/3/66, noted as Final, with credits for producer and director Dwight Hemion, screenwriters Sheldon Keller and Glenn Wheaton, and associate producer Carolyn Raskin. 65 leaves, with last page of text numbered 58. Mimeograph, with undated blue revision pages. 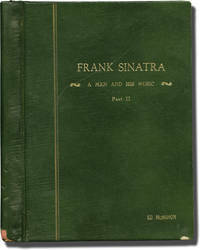 Pages Near Fine, lacking the wrappers, housed in a Very Good plus green faux leather covered spring binding. Los Angeles: Beacon Productions, 1946. Final Draft script for the 1947 film. Copy likely belonging to an uncredited costume designer, with notations in holograph pencil throughout. Groucho Marx's first solo film appearance, and his first with a real mustache as opposed to one made with grease paint. Marx plays an incompetent theatrical agent whose only client is Carmen Miranda, in her first film after leaving Twentieth Century-Fox, and who he tries to pass off as two different performers. Set in New York City, and shot there on location. Tan titled wrappers, noted as Final Draft on the front wrapper, dated October 28, 1946. Title page integral with the first page of the text. 97 leaves, with last page of text numbered 97. Mimeograph on pink stock. Pages Near Fine, wrapper Good, bound with two silver brads. Los Angeles: Twentieth Century-Fox, 1950. Temporary Script for the 1953 film musical, here under the working title "Friendly Island." A US Army officer and his men occupy a South-Pacific island after World War II where they encounter many women, under orders not to "fraternize" the comedy unfolds from their desire and restraint. 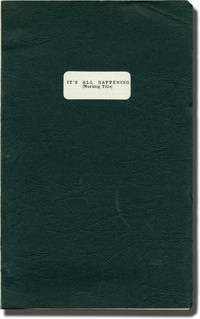 Green titled wrappers, noted as Temporary Script on the front wrapper, rubber-stamped copy No. 109 and production No. 363, dated Nov. 17, 1950. Distribution page present, with receipt removed. Title page present, dated November 17, 1950, noted as Temporary Script, with credits for screenwriters Albert Lewin and Burt Styler. 130 leaves, with last page of text numbered 112. Mechanically reproduced. Pages Near Fine, wrapper Very Good plus, bound with three gold brads. Hirschhorn, The Hollywood Musical. Los Angeles: Twentieth Century-Fox, 1951. Revised Final Draft for the 1953 film musical. Producer George Jessel, playing himself, holds a story writing conference where debates surrounding the life of vaudeville star Eva Tanguay (Mitzi Gaynor), the subject of the upcoming film, give way to conflicting stories told by her former partner Eddie McCoy (David Wayne) and piano player Charles Bennett (Oscar Levant). Red titled wrappers, rubber-stamped copy No. 50 and production No. 261, dated June 19, 1951. Title page present, dated June 19, 1951, noted as Revised Final, with credits for screenwriters Walter Bullock and George Jessel. 95 leaves, with last page of text numbered 94. Mechanically reproduced, with blue revision pages throughout, dated 6/26/51. Pages Near Fine, wrapper Very Good, bound internally with three gold brads. Hirschhorn, The Hollywood Musical. Los Angeles: Twentieth Century-Fox, 1938. Draft script for the 1938 film. 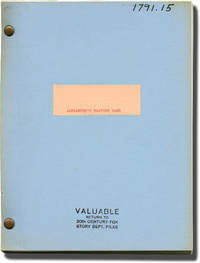 Internal reproduction made by Twentieth Century-Fox circa 1970s, with the studio's STORY FILES rubber stamp on the front wrapper. Named for Irving Berlin's 1911 hit, this film is the story of a young who shames his family by pursuing a career in jazz rather than "serious" music. The film retells the history of jazz music from its start to the rise of ragtime, to the acceptance of swing music as its own art form. Winner of an Academy Award and nominated for an additional five. Blue titled wrappers. Title page present, dated 1938, with credits for composer Irving Berlin, director Henry King, producer Harry Joe Brown, and screenwriters Kathryn Scola, Lamar Trotti, and Richard Sherman. 174 leaves, with last page of text numbered 172. Mimeograph. Pages Near Fine, wrapper Near Fine bound with two gold brads. Hirschhorn p.152. Beverly Hills, CA: Metro-Goldwyn-Mayer [MGM], 1937. Vintage photographs of director W.S. 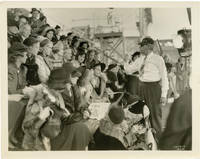 Van Dyke instructing a bleacher full of young women, including stars Eleanor Powell and Ilona Massey, on the set of the 1937 musical film. With a mimeo snipe on the verso. Based on the 1928 Broadway musical, about a West Point cadet who falls for a Vasser student who just happens to be a princess in disguise, with most of the original songs by George and Ira Gershwin replaced with new material by Cole Porter, including the classic "In the Still of the Night." 10 x 8 inches (25 x 20 cm). About Near Fine. Hirschhorn, The Hollywood Musical. Beverly Hills, CA: Metro-Goldwyn-Mayer [MGM], 1944. 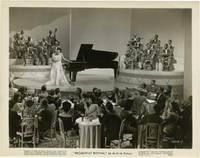 Vintage studio still photograph from the 1944 film, showing jazz vocalist Hazel Scott, who appears as herself in the film, performing onstage. With a typed notation on the verso identifying Scott. Loosely based on the 1939 Broadway musical "Very Warm for May" by Jerome Kern and Oscar Hammerstein, but following a similar showcase structure of MGM's "Broadway Melody" films. 10 x 8 inches (25 x 20 cm). About Near Fine. Hirschhorn, The Hollywood Musical. Universal City London: K.N.P. Productions / Universal, 1962. 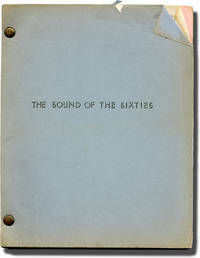 Draft script for the 1963 film. Laid in is a two page, stapled cast list, dated December 21, 1962, as well as a three page, stapled cast and unit list, dated December 21, 1962. Here under the working title, "It's All Happening." A local talent-spotter organizes a benefit concert to save the orphanage he grew up in. Later categorized as a "children's musical", this film featured a great number of actual popular singer and bands active in the 1960s in England. Green untitled wrappers with a die-cut title window in the British style. Title page present, dated November 29, 1962. 72 leaves, with last page of text numbered 71. Mechanically reproduced. Pages Near Fine, wrapper Near Fine bound internally with three silver brads. Weldon 1983. New York: Music Theatre, Inc, 1960. Draft script for the 1965 play. Revival run at New York City Center April 28 to May 9, 1965 for a total of 15 performances. Props and costume plot bound in. Based on "The Idyll of Miss Sarah Brown" and "Blood Pressure", two short stories by Damon Runyon. The musical has had several Broadway and London revivals, as well as a 1955 film adaptation starring Marlon Brando, Jean Simmons, Frank Sinatra and Vivian Blaine. Won five Tony Awards in 1951, including Best Musical. 1965 production starred Alan King as Nathan Detroit, Sheila MacRae as Adelaide, Jerry Orbach as Sky and Anita Gillette as Sarah. Set in Broadway, Save-a-Soul Mission, Havana, Cuba, and The Hot Box Club. Black titled wrappers. Title page present, with credits for story writer Damon Runyon, music and lyricist Frank Loesser, book by Jo Swerling and Abe Burrows. 141 leaves, with last page of text numbered 2-7-50. Mimeograph. Pages Near Fine, wrapper Very Good plus, bound with two gold brads. Paris: Cinedis, 1962. Original borderless single weight film still for the 1962 French musical film. Brief numerical notation on the verso in holograph pencil. Belgian actor-director Rouleau's nearly seen drama was the opening film at the 15th annual Cannes Film Festival, winner of the festival's Technical Grand Prize, and nominated for a Palme d'Or. Of note is the film's cinematographer Claude Renoir, whose other credits include "Serenade" (1940), "Madame Butterfly" (1954), "Barbarella" (1968), and "The Spy Who Loved Me" (1977). Isa is a dancer in a troupe of poor traveling comedians who perform in public; she stars as the Duchess of Teruel, unhappily married and in love with a poor man who inevitably commits suicide, resulting in Isa's nervous breakdown. 7 x 9.25 inches (17.75 x 23.5 cm). Very Good plus overall, with moderate curling, light edgewear, slight discoloration on the verso. Paris: Cinedis, 1962. Collection of 15 original borderless single weight film stills for the 1962 French musical film. Featured are several stunning images of acrtress Tcherina as Isa, Duchess of Teruel. Brief numerical notations on the versos in holograph pencil. Belgian actor-director Rouleau's nearly seen drama was the opening film at the 15th annual Cannes Film Festival, winner of the festival's Technical Grand Prize, and nominated for a Palme d'Or. Of note is the film's cinematographer Claude Renoir, whose other credits include "Serenade" (1940), "Madame Butterfly" (1954), "Barbarella" (1968), and "The Spy Who Loved Me" (1977). Isa is a dancer in a troupe of poor traveling comedians who perform in public; she stars as the Duchess of Teruel, unhappily married and in love with a poor man who inevitably commits suicide, resulting in Isa's nervous breakdown. 7 x 9.25 inches (17.75 x 23.5 cm). Very Good plus overall, with moderate curling, light edgewear, a handful with slight discoloration. Burbank, CA: Warner Brothers, 1957. Second Revised Final script for the 1957 film. 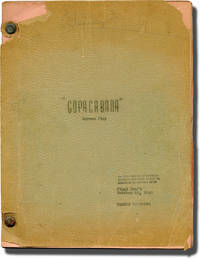 Director Michael Curtiz's presentation copy, in tan leather with gilt titles and Curtiz's name at the bottom right corner of the front board. A highly fictionalized portrayal of the life and career of Prohibition era torch singer/actress Helen Morgan. This film marked Curtiz's return to Warner Bros since leaving in 1954 due to a salary dispute. Ever since Morgan's death Warner Bros wanted to make a film biography though struggled to find an actress and continuously in development. Working titles included, "Why Was I Born?," "Both Ends of the Candle" and as printed in this copy, "The Jazz Age." Many female actresses auditioned including Doris Day who rejected due to her squeaky clean image. Blyth was chosen for her dramatic ability even though her singing voice was akin to Morgan's. Gogi Grant would supply the singing voice dubbed over Blyth. Set in New York, shot on location in Burbank, CA. Brown leather covered boards, titles in gilt. Distribution page present, with receipt intact. Title page present, dated 1/29/57, with credits for screenwriter Nelson Gidding. 130 leaves, with last page of text numbered 124. Mimeograph, with blue revision pages throughout, dated variously between 2/6/57 and 3/8/57. Pages Near Fine, binding Very Good plus.